Only 16% of responding utilities reported smart meters as their primary source of outage notification on blue-sky days, 12% during storms. 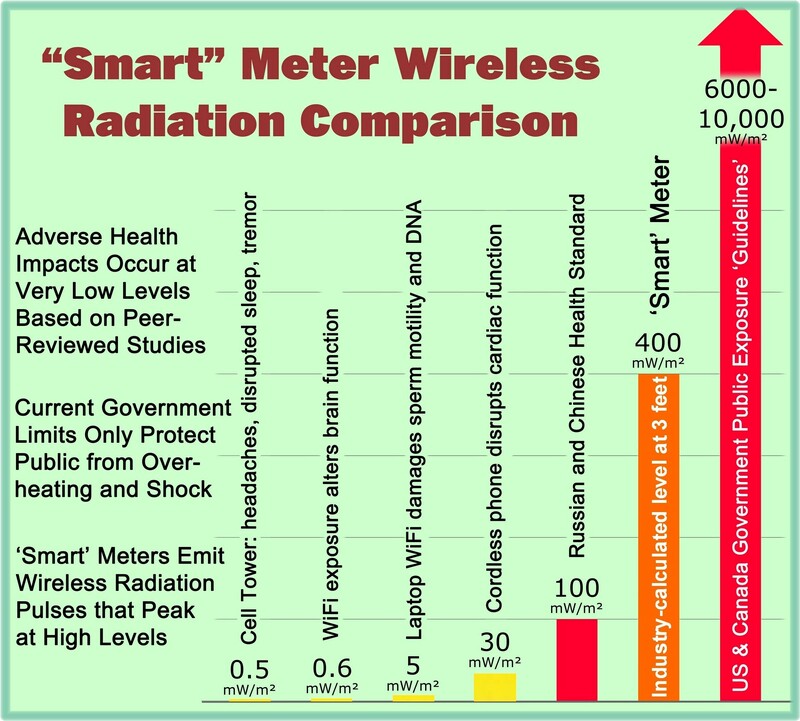 The above information helps to expose the hype surrounding the advertised benefits for smart meters and why these RF-emitting, privacy invading, hackable devices were supposedly needed to be installed in the first place. [Note 1] SCADA (Supervisory Control and Data Acquisition) – This term refers to systems that employ an array of communication protocols, primarily for substation monitoring and distribution automation purposes. SCADA systems consist of sensors to “acquire data” which can then use that data to automatically “supervise and control” a response. “Uh-oh, the power is off. How does the Smart Grid help me now? As reported by the industry survey, customer calls are not “the only way” utilities know when customers lose power. They have used SCADA systems at the transformer and substation level for years, and more of these types of systems could be installed to improve notification capabilities without attaching a smart meter to each home. It can be shown that SCADA-related systems are an appropriate tool for load control as well as outage and restoration management. Smart meter “last gasp” [see Note 2] power outage notifications can be used to reliably identify when power has been lost for single customer outages, provided that the utility’s Outage Management System (OMS) [see Note 3] has been designed to process these messages. However, as the size of the outage grows, only a small percentage of the smart meter outage notifications will be delivered to the utility, probably for no more than 20 to 30% of the meters affected in an outage. Thus, it is unrealistic and misleading to advertise that a smart meter will identify your home as being without power with notification to the utility of that condition. [Note 2] “last gasp” — a short burst transmission made by a smart meter upon loss of power, typically used to indicate such loss of power and often providing time and/or date information associated with the outage. [Note 3] Outage Management System (OMS) – utility software application that is used to help identify where power outages exist and then restore service to customers. Smart meter power outage notifications originating from within an RF mesh network rely on relaying that information (hopping) from one meter to another. For widespread outages where thousands of meters lose power simultaneously, only the meters near the fringe of the outage area may be ultimately received by a still powered gatekeeper or take-out point. Some utilities have back-up power supplies for the gatekeeper units and some don’t. Even for those that do, the gatekeepers can be overwhelmed with “last gasp” messages during large outages such that only a small percentage are correctly received and forwarded to the utility. 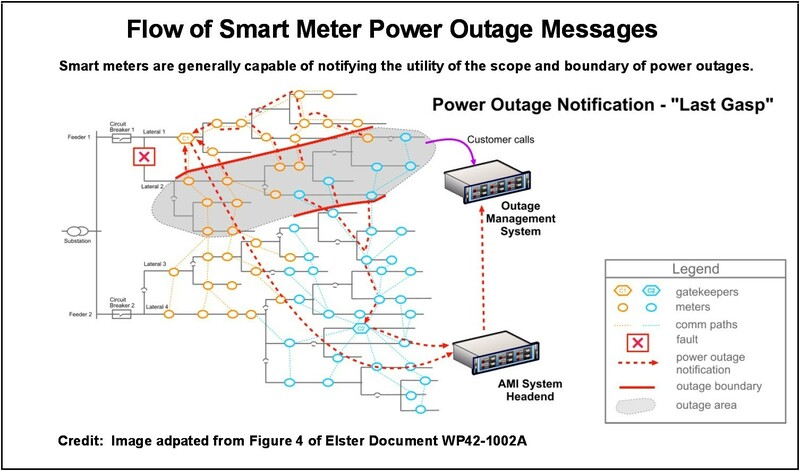 The figure below shows how smart meter “last gasp” messages can generally only identify the scope and boundary for widespread power outages, … not each individual customer who is without power. It is therefore quite possible that utilities will internally decide that smart meter power outage notification capabilities function no better than already existing SCADA-related systems supplemented by customer calls. As was mentioned earlier, smart meter power outage notifications can reliably identify single customer service outages. However, utilities must decide from a cost/ benefit perspective whether the considerable investment necessary to integrate these “last gasp” signals into their existing Outage Management System (OMS) software applications is warranted for this limited purpose. Also, the integration of these systems is not easy; simple integration can lead to false positive notifications which obscures real outage information. An industry survey of utilities has just revealed that only 16% of utilities surveyed use their smart meters as the primary source of power failure alerts on blue sky days and 12% during storms. But the survey did not explain why. This article provides a perspective that smart meter power outage notifications are more hype than reality. Smart meter “last gasp” power outage notifications are of limited value to the utility and can arguably serve utilities no better than SCADA systems already in place, supplemented with customer trouble calls. In addition, “last gasp” meter messages mean nothing to anyone unless the utility’s Outage Management System (OMS) software is successfully updated (at considerable expense) to process and filter these signals that would then be used to help determine the scope and nature of utility outages. There are existing alternative methods for outage identification and restoration beyond that of the smart meter. Given the many risks related to smart meter technology, let’s continue to use and improve those methods rather than attaching a smart meter to each and every home in America and elsewhere. 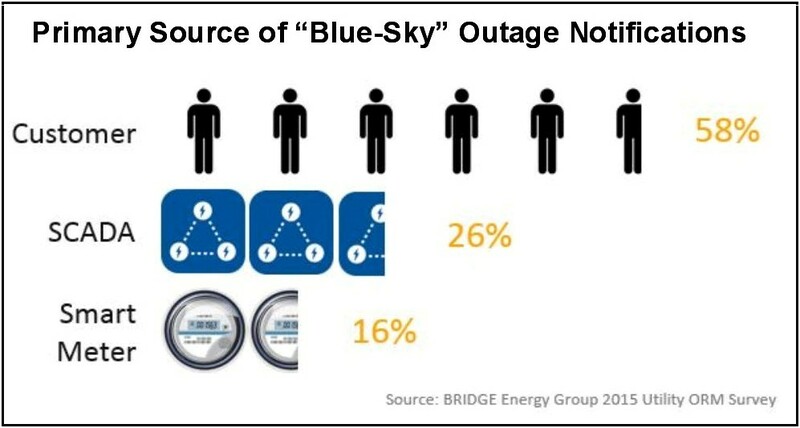 “2015 Utility Industry Survey: Outage & Restoration Management Survey Results Summary”; download a full copy of the industry survey at https://www.bridgeenergygroup.com/wp-content/uploads/2015-BRIDGE-Survey-ORM-Results-Summary-final1.pdf. “Getting Smarter About the Smart Grid,” by Timothy Schoechle, Ph.D.; the National Institute for Science, Law & Public Policy; November 2012; available at http://gettingsmarteraboutthesmartgrid.org/pdf/SmartGrid_Report_PDF-2012-11-26-Final.pdf. This entry was posted in Smart Grid, Smart Meters, and RF Emissions and tagged Last gasp, Power Outage, Smart Grid, Smart Meters. Bookmark the permalink.